Seek and destroy swirl marks with the FLEX Swirl Finder Light! The FLEX Swirl Finder Light is a specially designed LED flashlight that shows the true condition of your paint. The FLEX Swirl Finder Light illuminates swirls that the naked eye cannot see, making it easier to track your progress as you work towards creating a swirl-free finish! 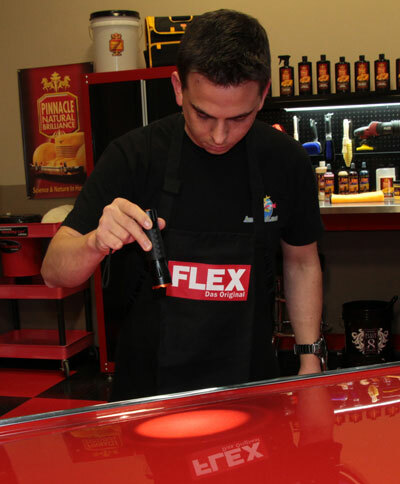 The FLEX Swirl Finder Light is a valuable tool for detailers and anyone passionate about a perfect paint finish. FLEX Swirl Finder Light makes swirls easier to see so you can track your progress! Swirl marks are a car care enthusiast’s worst nightmare – it’s a fact! If you stumbled across our website in search of paint compounds and polishes for removing swirl marks, the chances are you’re tired of looking at them! While swirl marks are easily spotted in direct sunlight, they disappear as soon as you pull your vehicle in the garage. 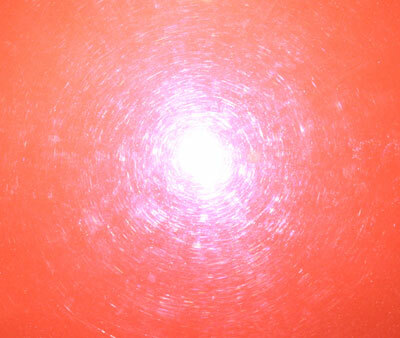 Once you start polishing, it’s difficult to tell if you completely removed the swirl marks. Take the guesswork out of swirl removal with the FLEX Swirl Finder Light! FLEX is a name that’s synonymous with quality and innovation, and the FLEX Swirl Finder Light is no exception. With a rugged aluminum case secured in non-slip rubber grip, the FLEX Swirl Finder Light is a quality piece that is built to last. What’s more, the FLEX Swirl Finder Light is packaged in a sturdy box for safe storage. The FLEX Swirl Finder Light is far more than just a flashlight. FLEX set out to design a compact, lightweight, reliable light that makes it easy for you to track your progress as you polish your vehicle – preferably with a FLEX polisher! The FLEX Swirl Finder Light utilizes a 3-watt LED bulb that is able to illuminate swirl marks, spider web scratches, water spots, and other gloss-hindering paint imperfections. The focus of the beam can be adjusted depending on your distance from the surface. A three-stage tail switch toggles the beam between hi-power, low-power, and strobe settings. Hold light approximately 8 to 12 inches away from surface. Hold the light at a slight angle so light bounces back at your eye. Polish paint using appropriate pad and polish combo. Use light to inspect results. Includes 3 AAA batteries and a lanyard. Been using it for three years. Great scratch finder. I use it daily and it has taken lots of abuse for the last three years. It's handy for me to have a nice rubber surface around the body of the light, because I like to hold often in my teeth. The light beam is very adjustable as well. With the LED, the batteries last a good long time too. ConsMaybe there are fancy lights out there. But this one is fits in your pocket. I feel like I have purchased one of everything on Autogeek over the last year or two, the latest purchase included this light. I have wanted one for a while and either a.) I take too good of care of my cars or b.) this thing did not work as well as I hoped. I think if you don't have the best lighting in your garage or shop than this would be a helpful tool. Or if you are dealing with a car that has not been detailed in a while it might help to check your work as you go. But by and in large I could not tell a big difference between this light and my LEDs and Flourecents in my garage and this. No matter what angle or distance I shined it at. Its not bad, I just would not buy again. ProsLowest cost out of the ones available, compact size, very easy to use as instructed. ConsI was expecting a big reveal like they show on their videos, not so much. I also think the battery holder design is bad. Its got a three battery clip that you load which then slides into the flashlight. In my experience these types of battery "holsters" cause the batteries to weep over time if you don't remove the batteries prior to storing. Good light. Perhaps a bit overpriced. This is a good light that works for the intended purpose, but I had expected that It would be somewhat purpose-built for swirl finding. In fact, it seems that the swirl-finding capabilities of the light are very little different than those of any other standard small LED flashlight. Also, the construction quality of this light is good, but certainly no better than any other standard LED flashlight in this price range. Pros- The adjustable diameter of the light beam. - The small size easily fits into any detailer's bag. Cons- Construction quality is good, but not great. A must for anyone serious about detailing.